Award-winning High Weald Dairy’s firm organic sheep’s cheese with wild seaweed. This unique cheese is made by hand, matured for 12 weeks, then lightly coated in seaweed from the cold, clear waters of the Outer Hebrides. An unusual combo, but it works – Seven Sisters is sharp and slightly sweet, with a wonderful unctuousness and a subtle hint of the sea. Keep in the fridge. Once opened, use within 3 days. The multi award-winning High Weald Dairy is owned and run by the Hardy family (Guy, Mark and Sarah) on their organic farm in Horsted Keynes, West Sussex. 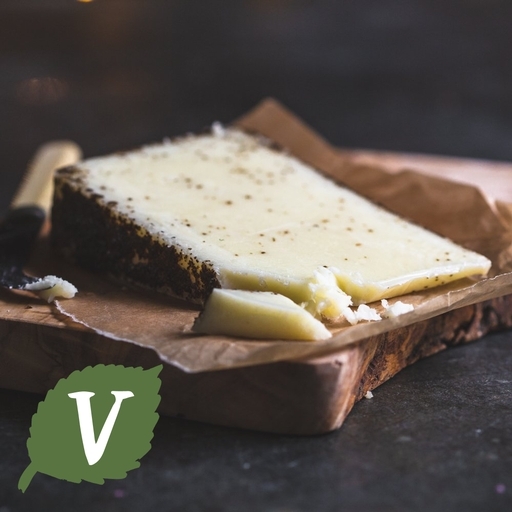 They’ve teamed up with FlaVit Seaweed, who provide sustainable wild seaweed from the Outer Hebrides, to make this unusual Seven Sisters cheese. It gets its name from the seven iconic white cliffs on the Sussex coast, not far from the dairy. Pasteurised sheep milk, sea salt*, seaweed, vegetarian rennet, cultures*.